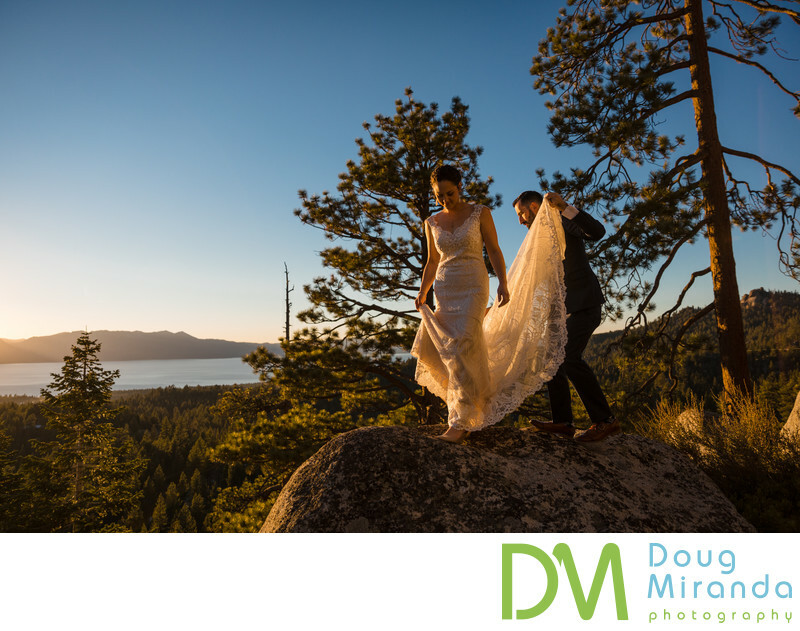 Tahoe Blue Estate wedding photographers taking pictures of a bride and groom walking onto a giant granite boulder in the forested backyard of the private home wedding venue. We were rushing around to get a couple last photos before the sun set behind the mountains on the west shore and before their reception started. Tahoe Blue Estate is one of the most amazing private home wedding locations in all of the Tahoe Basin. The private home located on the top of Kingsbury Grade in Stateline Nevada. The estate was built in 1992 for the original owner Charlie Ray, founder of Sea Ray Boats. The home is located on top of bluff surround by giant granite boulders over looking Lake Tahoe. There are breather taking views of the lake from almost every room and deck in the house. The estate is located just about a 2 miles from the Stagecoach lodge and ski lift at Heavenly Ski resort and Tahoe Rim Trail. The casinos and restaurants are just a short drive down Kingsbury Grade. But with all the estate as to offer like a game room, spa, two bars and endless views of the Lake Tahoe there’s really no reason for you to ever have to leave the property other than to go home after your amazing wedding event or vacation. Tahoe Blue Estate, 650 Tina Ct. Stateline, NV 89449. Flowers and arrangements, DYI, the couple’s friends and family designed and made them. DJ, DYI, The couple’s friends and family helped them out with music for the ceremony and evening. Wedding Officiant, DYI, was the groom’s aunt married them. Location: 650 Tina Ct. Stateline, NV 89449. Keywords: Tahoe Blue Estate (18).